Our philosophy is to apply technology in ways that enhance our ability to deliver projects faster, more cost effectively, in a collaborative environment and with a greater level of quality. 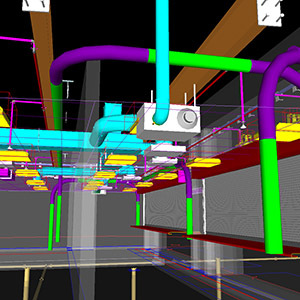 For over 12 years, Wilson Electric has utilized BIM/3D modeling and our staff has tremendous experience on an array of projects. Our in-house BIM/Virtual Design department utilizes the latest versions of Autodesk software including Navisworks, AutoCAD and Revit. We also utilize Bluebeam, BIM Glue and BIM 360. We have the expertise and experience to compose 5D BIM modeling for building maintenance purposes. By creating a working model including replacement part numbers, cut sheets, installation guides, warranty information and maintenance logs, building maintenance is conveniently located and accessed. Starting in preconstruction, we use BIM to visualize the work, quantify the scope and assist in scheduling construction activities. The technology is carried into the field where timely model information management helps our field personnel get it right the first time through coordination of the building systems, prefabrication, efficient processing of shop drawings and quality control. Wilson Electric understands the significance of team collaboration in a project’s success. Virtually designing a project allows for better understanding, improved communication and cost effective coordination, as well as efficiency and improved quality control. Using the 3D model and collision detection, we can reduce overall cost and schedule, eliminating problems before construction ever begins.